This blighted spot, however, is a mandated compensatory wetland mitigation under Section 404 of the Clean Water Act of 1972. The pizzeria was built on land that was reclaimed from the neighboring riparian marsh on the banks of Maple Meadow Brook. The pit was constructed as a condition of the U.S. Army Corp of Engineers’ permit to build at this location. The construction of a wetland demands a range of skills seldom found within the domain of a single profession or trade. There isn’t a set formula for building a team, which might include, among others, civil engineers, hydrologists, wildlife biologists, wetland scientists, soil analysts, contractors, suppliers of native plants and synthetic soil mixtures, and, last but not least, landscape architects. Each player’s perspective shapes the vision of a successful outcome. With so many cooks in the kitchen, the broth is easily spoiled. In the world of hardscape building, the coordinating vision is held by the architect, who collaborates with professionals in a myriad of specialties and who ultimately supervises the process of building. In the less familiar realm of wetland construction, the roles remain more fluid. The paradigm is primed for evolution. The report found that, more broadly, 67 percent of the projects fulfilled the stipulations of their permits, even if this resulted in a less than complete replacement for the lost wetlands. The end result may have been an “out of kind” compensation, in which, for example, a mitigation project created a palustrine environment instead of a replacement for a forested wetland that was lost. A common failure is the creation of a pond. Open water, without the interwoven mesh of hydrophilic vegetation and animal life found in swamps and marshes, is not considered a wetland by scientific or regulatory definitions. Ladd’s report followed on the heels of a large-scale study conducted by the National Research Council that was published in 2001. In 2008 a new set of regulations was rolled out, raising the bar for future mitigation efforts. The pizzeria mitigation site is small, less than a quarter of an acre, making connections to the surrounding ecosystems difficult, and it is surrounded by suburban development. No planting was required to be executed in the initial permit. This left the bare soil vulnerable to colonization by Phragmites, which, even after more than 30 years, has maintained its dominance on the site. It is evident that this place is no substitute for the lush diversity of the emergent wetland that construction on this site destroyed. 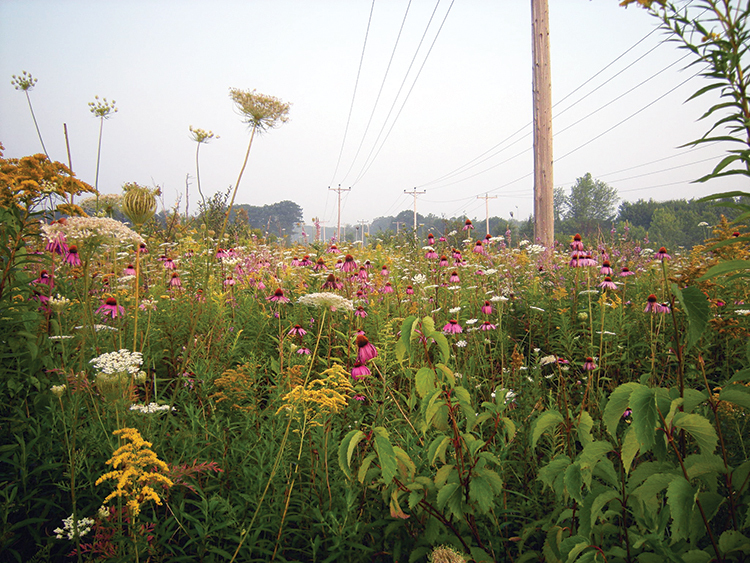 Postconstruction, a meadow has formed in the right-of-way used by the power company. From the outset of mandated wetland compensation programs, it has been difficult to assess the success of these crucial undertakings. The red-winged blackbird is a poor judge of wetlands, at least as far as biodiversity is concerned. “They’re not fussy,” said Ladd. “They’re like squirrels or raccoons. They can adapt to a lot. They’re not good indicators of high-quality wetlands. They’re not indicators of bad wetlands, necessarily, but they can tolerate lots of conditions.” In fairness, Ladd pointed out that the project does fulfill its statutory function, which is stormwater containment, and that some water-quality function was probably maintained. Indeed, Phragmites is favored for ecological graywater treatment schemes. The North American continent has lost more than half of its wetland resources since the arrival of Europeans in the 16th century. In some areas the losses are even greater: California has lost an estimated 90 percent of its wetlands; Ohio, typical of midwestern farming states, about 80 percent. Profound cultural mistrust of swamps and marshes, coupled with aggressive programs to expand agricultural productivity and urban development through what was called “land reclamation,” have taken a staggering toll on this complex and subtle range of ecosystems. Farmland was victorious in this battle. (This is one reason, after all, that I can now expect to enjoy organic strawberries shipped from California fields in the depths of a New England winter.) Europe has fared no better: The Lower Danube watershed, for instance, has lost 69 percent of its wetlands. The percentages are typical of industrialized agriculture wherever it is found. But now, with ecosystems around the globe showing undeniable symptoms of strain, the need to retain and even recover the lost functions of wetlands has become imperative. Jessica Wilkinson, the senior policy adviser for mitigation for the Nature Conservancy, says that in the United States alone, $2.9 billion per year is disbursed in wetland mitigation projects, which include the establishment (that is, creation), restoration, augmentation, and preservation of these biomes, the four categories articulated by the legislation now known as the Clean Water Act. Passed as an amendment to a 1948 statute and itself amended several times since, it is the backbone of the regulation and enforcement of wetland protection, although myriad agencies on the federal, state, and local levels share jurisdiction in this activity. The Fish and Wildlife Service of the Department of the Interior, a major player, has been involved in wetland management since 1871. The Army Corps of Engineers, which already has had, since 1899, authority over America’s navigable waters, and the Environmental Protection Agency were given shared responsibility for implementing the Clean Water Act. In a conference room at the corps’ New England offices, tucked behind Hanscom Air Force Base in Concord, Massachusetts, an affluent suburb west of Boston, Ladd and Tim Dugan, a public affairs officer, introduced me to the basic administrative landscape of wetland mitigation. The corps is 98 percent civilian. Nevertheless a certain spartan quality pervades the facility, which welcomes visitors with a tank-proof security gate. The corps cannot grant permits to its own projects. “Mostly we’re dealing with private entities,” said Ladd. “Or cities, states, departments of transportation, individuals, someone building a subdivision. Could be just someone doing a house…wind farms. It covers the whole gamut.” “Avoidance” and “minimization” are the first protocols with regard to impact on wetlands. The corps and the EPA discourage the alteration of wetlands, thus avoiding impact. In some cases, design review will minimize damage to the wetland environment, and the corps offers user-friendly guides to help developers make decisions that favor the ecological qualities of the location. “Mitigation” comes into play when the first two protocols can’t be accomplished. Environmental law makes a distinction between the “functions” of wetlands and their “services” (previously known as “values”). Wetlands perform objective functions in an ecosystem, including floodwater storage, water filtration, wildlife habitat, carbon sequestration, and so forth, without regard to human concerns or interests. In theory, the effectiveness of “functions” could be quantified through scientific assessment tools. By contrast, recreational, aesthetic, or educational qualities that wetlands possess are “services”: They are of concern to the human population for cultural rather than objectively quantifiable reasons. Even with this distinction at hand, evaluating the success of a given project is far from a simple matter. Wetland functions are complex, and natural wetlands themselves are constantly changing and may indeed have problems of their own. The pizzeria site was permitted in 1983, early on in the regime of mandated wetland construction and restoration. Much has been learned since, and the two agencies have better learned how to coordinate their efforts. Based on a careful analysis of the success and failures of the program conducted by the National Research Council, a new regulatory statute went into effect in 2008. Alternatives to small-scale “permittee-responsible” projects—the type most prone to failure—now include “in-lieu fee” programs, through which permit applicants pay a flat fee based on the size of the project to a third party to fulfill their obligation to reduce or offset the impact of their proposed projects on wetland resources, and the enticingly named “mitigation banks,” in which ecological credits accumulated through wetland restoration or creation efforts made by nonprofit or for-profit entities can be sold to developers. The Nature Conservancy and Ducks Unlimited are two of the nonprofit organizations that have entered the mitigation-banking field. For-profit banks have attracted a range of investors, but none are currently active in the Northeast, where land prices are high enough to make profitability difficult. (I contacted several for-profit mitigation banks while researching this article. None returned my calls.) Mitigation banks have the advantage that their wetland resources have already been constructed at the time that the credits are sold. This is not the case with in-lieu fee programs, where the pooled financial resources do not immediately produce a functioning wetland to replace the lost ecosystem. Indeed, it has been alleged that such funds, often administered by state agencies, are prone to sequestration during times of tight budgets. In all cases, the success of a project is monitored for a number of years, and if a wetland is not successful, additional work can be demanded to solve the problem. Fixing failed mitigation projects can thus cost developers money and leave them on the hook, so to speak, for years after a project has been otherwise completed. 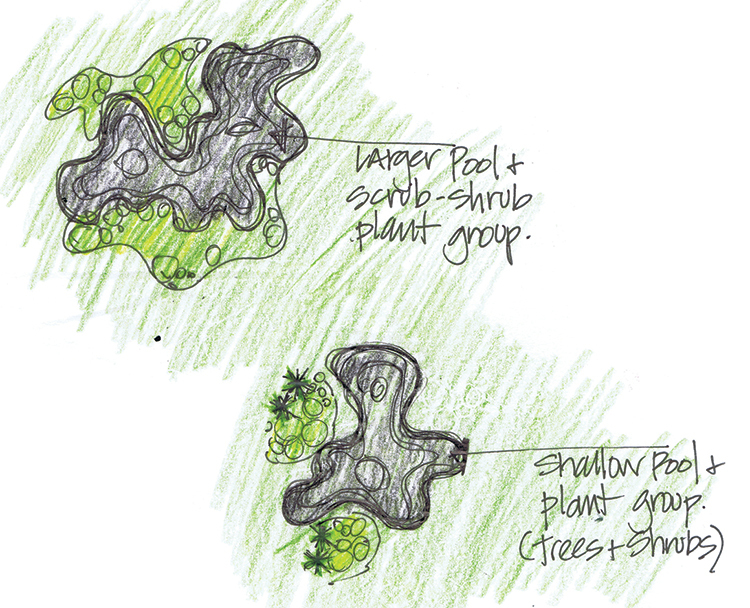 Lisa Cowan’s “napkin sketch” shows the design development for the Westbrook mitigation. 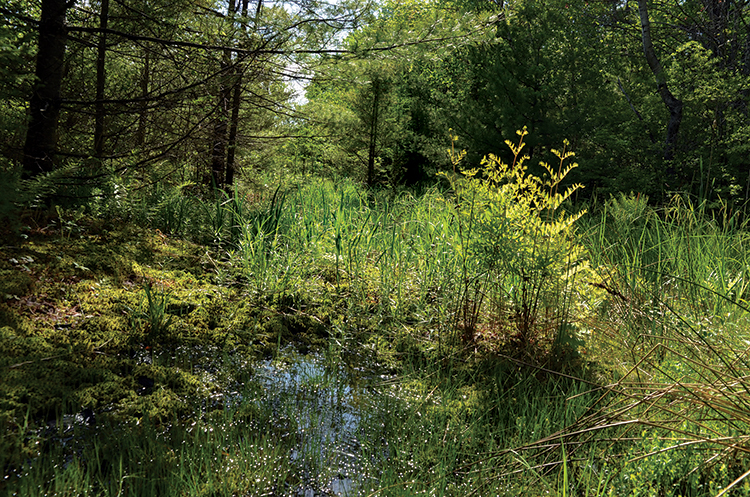 In the new regulatory environment, the planning and design phase of a mitigation project has become the critical stage for the ability of governmental agencies to enforce their mandate to prevent a net loss of wetland function. Agencies can evaluate a project based only on what they asked for in the first place. Some functions, such as water storage or water quality improvement, can be performed only at the site of the wetland loss: hence the pit at the pizzeria. But more dimensions of wetlands’ ecological performance can be demanded in larger, often off-site compensatory projects. 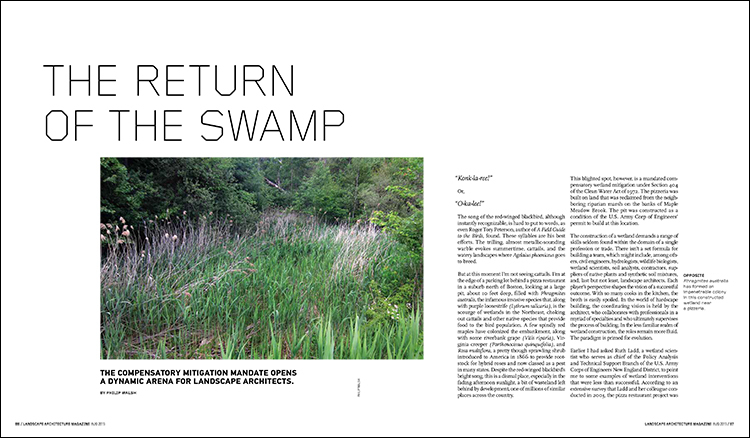 Landscape architecture has a long history of engagement with the aesthetic dimension of wetlands. Frederick Law Olmsted’s designs for the Back Bay Fens, for example, drew on the British picturesque tradition and incorporated substantial areas of marsh where Phragmites australis has revealed its most attractive characteristics, framing gracefully arching stone bridges with waving green and golden masses. The role of the landscape architect within the realm of the ecologically functioning landscape remains, however, underexplored terrain. Lisa Cowan, ASLA, the founder and principal of Studio-verde, a Portland, Maine-based landscape architecture and environmental services firm, passionately believes that landscape architects have a lot to offer that will ensure the success of wetland mitigation projects. Cowan, along with the policy analyst Marla Stelk and the landscape architect Allegra Bukojemsky, ASLA, of Wildlands, presented a panel at the 2014 ASLA Annual Meeting exploring the topic of wetland restoration and the role of the landscape architect. “The landscape architecture profession actually kind of turned its back on this work years ago,” Cowan said during lunch at a busy restaurant in downtown Portland. “The science guides the process. That’s not something that a lot of people are attracted to.” Cowan is an exception. Through her work for an engineering firm under contract to state agencies such as the Maine Turnpike Authority and the Maine Department of Transportation, Cowan was able to participate in project teams that included engineers, hydrologists, wetland scientists, agency officials, and contractors to produce compensatory wetlands that either re-established wetlands that had previously been destroyed by construction or established functioning wetlands on land that had not previously been wetland, a feat considered all but impossible by some regulators. “There’s not a lot of eye candy in this,” Cowan said. Later that afternoon, however, we parked on the edge of a highway on the outskirts of Portland. The road’s margin had a light sprinkling of the usual litter of fast-food wrappers, crushed cigarette packs, and beer cans. But after we had walked about 15 yards away from the roadway we were standing boot-deep in a cranberry bog, lushly tapestried with sphagnum moss, bordered by scrubby pines and forested wetland. Perhaps not the stuff of picture postcards, but nevertheless a vibrant and refreshing place to be on a sunny afternoon in early June. The site had previously been a highway exit ramp that had served Scarborough Downs. Once the asphalt and concrete had been jackhammered up and carted away, the original hydrology of the site reasserted itself, making this apparently seamless “re-establishment” possible. The paradox of this success is that the work has become essentially invisible: Nature has taken over. It takes a distinctive design perspective to embrace this eventual self-effacement. In the end, wetlands restorations must be self-sustaining, self-regulating environments. They are not gardens. Earlier that day we had walked through a much larger wetland that Cowan, at that time employed by Duke Engineering, and her teammates had created under contract with the Maine Turnpike Authority to mitigate the construction of the Rand Road interchange in Westbrook, Maine. Conrad Welzel, the government relations manager for the authority, met us at the site, which is fenced and otherwise inaccessible: At present it provides no human-oriented “services” whatsoever. A sectional detail of the microtopography and tree snag installation at Westbrook. What had once been a cow pasture of about 17 acres, roughly bisected by a creek, has become stable as a series of interconnected wetlands offering open water, emergent marsh, shrub–scrub areas, and uplands that are slowly filling in with larger shrubs and young trees. Extensive regrading lowered the topography of the site by as much as six feet, generating tens of thousands of cubic yards of material that was incorporated into the embankments of the new roadway. Materials from the highway construction were also used in the restoration project. Snags were recycled and installed in the lowlands, providing perching space for birds and also producing the somewhat uncanny feeling that this marsh had been here long enough to have flooded out mature hardwood trees. And there’s a pragmatic side, as well: “Birds take the seeds and then sprinkle them around. It’s a very inexpensive way to revegetate a site,” Cowan said. The site is not totally pristine. A few invasive species have found a toehold here and there. But the vast majority of the plant life, whether part of the initial construction or as volunteers that established themselves through natural processes, is native, including a meadow of purple coneflower (Echinacea purpurea) that has colonized an area maintained as a right-of-way for power lines. Welzel, representing the client’s point of view, is very happy with the result. “You usually negotiate a five-year time frame for it to become a wetland. What ends up happening more often than not is that you have to make it a 10-year process. We were done in five years.” The savings are self-evident. Welzel now looks for a team approach to mitigation planning in which less hierarchical models prevail and problems can be addressed collaboratively, without turf wars between professional specialties. Ducks Unlimited administers in-lieu fee mitigation programs for the state of Vermont and operates a mitigation bank in Tennessee. Peter Wyckoff, a civil engineer who serves as the manager for conservation services and mitigation, is in the process of designing his first mitigation project there. The organization has been a steward of wetlands since 1937, and has conserved more than 13 million acres along the way. Not without reason they consider themselves expert in the matter. They routinely execute their own designs without the services of landscape architects. Nonetheless, Wyckoff sees a role for landscape architects. “I actually do view them as being more ecologically friendly than a straight civil engineer who would rather concrete line a channel as opposed to designing a more natural appearance,” he said. Andrew Bohne, ASLA, a registered landscape architect who works for New England Environmental, Inc., a for-profit multidisciplinary firm located in Amherst, Massachusetts, emphasized the importance of following the lead of wetland scientists and remaining engaged in all aspects of the planning and design of a project. Construction management and oversight are key arenas. “It’s probably the most important piece, because you can have a great design, you can have a very well-thought-out idea, but if you get the hydrology wrong your whole thing is shot,” Bohne said. Cowan also emphasized the role of landscape architects in directing the construction of microtopography and minimizing the compression of soils. “Scientists aren’t taught to build things,” she said. Evaluating the success of a mitigation project involves many factors, and there isn’t a meaningful single standard in place. The terms written into the permit are the guide. “One lesson we learned is that you can’t just look at the plants,” Ladd said. “You’ve got to look at the soil and you’ve got to look at the hydrology. The hydrology drives the whole thing.” Striking the right balance of water on the land is difficult, and neither a pond nor a meadow provides the same ecological functions as swamps or marshes. Unfurling fronds of moisture-loving Osmunda regalis (royal fern, center right) catch the morning sun. Wetlands serve as carbon sinks, especially in climates with warm summers and cold winters. They are extremely productive biologically, and the vegetation that dies and remains in a saturated environment decays as much as 19 times more slowly than dead vegetation elsewhere. One component of wetlands is the presence of hydric soils and the associated limits on oxygen in the soil. This slows decomposition, but perhaps even more important is the precondition for the biogeochemistry of anaerobic processes. The absence of oxygen forces microorganisms to employ metabolic synthesis that draws energy from magnesium, sulfur, iron, and other elements in the environment. Wetlands are therefore able to alter the behavior of elemental compounds on a molecular level in a complex exchange of energy and matter. Hydrogen sulfide, one of the components of a salt marsh’s characteristic fragrance, is in fact a by-product of the anaerobic process and an indicator of its normal functioning. The Clean Water Act, and the state and local programs that offer protection for wetlands and that attempt to reverse their loss, come after many centuries of efforts to revamp and reuse these essential components of the world’s topography. From the long battle to subdue the Pontine Marshes near Rome right down to land reclamation programs in 20th-century America, the swamp has been the enemy. Not all civilizations have lived this way. The ancient Egyptians sustained their culture for three millennia by living in balance with the flooding cycle of the Nile. They regarded the wetlands with respect and even a certain awe at their magical role in sustaining their lives. A relief found in a tomb in Saqqara dating from about 2400 BCE shows Ti, the deceased, a wealthy commoner, standing in a boat made of reeds, watching a hunt in the marshes. In accordance with the Egyptian representational system, his body looms much larger than those of the slaves and attendants who accompany him. Yet he in turn is dwarfed by a monumental stand of papyrus, Egypt’s archetypal plant and hallmark of its wetlands. Below, the waters teem with fish and hippopotami. Above, the reeds are full of birds and small animals. The blooms of the papyrus blot out the sky. For Ti, the wetlands are paradise. Philip Walsh is a writer and researcher based in central Massachusetts. He can be reached at philipwalshphd@gmail.com.